The Dynamic Multipoint VPN Tunnel Health Monitoring and Recovery feature enhances the ability of the system to monitor and report Dynamic Multipoint VPN (DMVPN) events. It includes support for Simple Network Management Protocol (SNMP) Next Hop Resolution Protocol (NHRP) notifications for critical DMVPN events and support for DMVPN syslog messages. It also enables the system to control the state of the tunnel interface based on the health of the DMVPN tunnels. SNMP is enabled in the system. Generic SNMP configurations for Get and Set operations and for notifications must be implemented in the system. All relevant NHRP traps are enabled. SNMP SET UNDO is not supported. The MIB Persistence feature that enables the MIB-SNMP data to persist across reloads is not supported. However a virtual persistence for MIB the notification control object happens, because that information is also captured via the configuration command line interface (CLI). Notifications and syslogs are not virtual routing and forwarding (VRF) aware. The Rate Limit Exceeded notification does not differentiate between the IPv4 or IPv6 protocol type. Interface state control can be configured on leaf spoke nodes only. Interface state control supports IPv4 only. A spoke perceives that a hub has gone down. This can occur even if the spoke was not previously registered with the hub. A spoke successfully registers with a hub. A hub perceives that a spoke has gone down. A hub perceives that a spoke has come up. A spoke or hub perceives that another NHRP peer, not related by an NHRP registration, has gone down. For example, a spoke-spoke tunnel goes down. A spoke or hub perceives that another NHRP peer, not related by an NHRP registration, has come up. For example, a spoke-spoke tunnel comes up. The rate limit set for NHRP packets on the interface is exceeded. The agent implementation of the MIB provides a means to enable and disable specific traps, from either the network management system or the CLI. All next-hop state change events. For example, when the system declares that a Next Hop Server (NHS), Next Hop Client (NHC), or a Next Hop Peer (NHP) is up or down. The severity level for these messages is set to critical. NHRP resolution events. For example, when a spoke sends a resolution to a remote spoke, or when an NHRP resolution times out without receiving a response. The severity level for these messages is set to informational. DMVPN cryptography events. For example, when a DMVPN socket entry changes from open to closed, or from closed to open. The severity level for these messages is set to notification. NHRP error notifications. For example, when an NHRP registration or resolution event fails, when a system check event fails, or when an NHRP encapsulation error occurs. The severity level for these messages is set to errors. DMVPN error notifications. For example, when the NET_ID value is not configured, or when an NHRP multicast replication failure occurs. The severity level is set to notification for the unconfigured NET_ID value message, and set to errors if an NHRP multicast replication failure occurs. Rate limit set for NHRP packets on the interface is exceeded. This event occurs when the NHRP packets handled by the NHRP process exceeds the rate limit set on the interface. The severity level for this message is set to warning. The Interface State Control feature allows NHRP to control the state of the interface based on whether the tunnels on the interface are live. If NHRP detects that all NHSs configured on the interface are in the down state, NHRP can change the interface state to down. However, if NHRP detects that any one of the NHSs configured on the interface is up, then it can change the state of the interface to up. If the interface state changes, the generic routing and encapsulation (GRE) interface generates IF-MIB notifications (traps) that report a LinkUp or LinkDown message. The system uses these traps to monitor the connectivity to the DMVPN cloud. If the interface state changes to down, the Cisco IOS backup interface feature can be initiated to allow the system to use another interface to provide an alternative path to the failed primary path. If the interface state changes to down, the system generates an update that is sent to all dynamic routing protocols. This provides a failover mechanism for dynamic routing when the multipoint GRE (mGRE) interface is down. If the interface state changes to down, the system clears any static routes that use the mGRE interface as the next hop. This provides a failover mechanism for routing when the mGRE interface is down. The interface state control feature works on both point-to-point and mGRE interfaces. The diagram below describes how the system behaves when the Interface State Control feature is initialized. The Interface State Control feature is enabled on the GRE interface with NHRP configured. The system reevaluates the protocol state and changes the state to line up and protocol down if none of the configured NHSs is responding. The line up state change initiates the NHRP registration process. 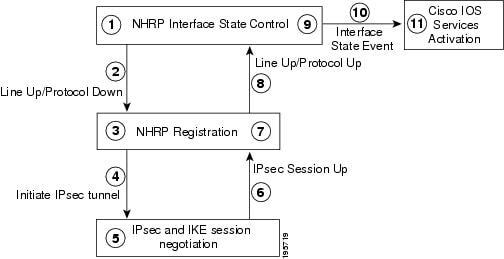 The NHRP registration process initiates the IPsec tunnel. The IPsec tunnel initiation starts the IPsec and IKE tunnel negotiation process. On successful completion of the tunnel negotiation process, the system sends an IPsec Session Up message. The NHRP registration process receives the IPsec Session Up message. The NHRP registration process reports the line up and protocol up state to the GRE interface. The GRE interface state changes to line up and protocol up. The system reports the GRE interface state change to Cisco IOS software. The state change triggers Cisco IOS services, such as interface event notifications, syslog events, DHCP renew, IP route refresh and SNMP traps. The tunnel health monitoring and recovery features allow you to configure SNMP NHRP notifications and interface states. You can configure an interface so that SNMP NHRP traps are generated for NHRP events. In addition you can configure the system to send the traps to particular trap receivers. To configure SNMP NHRP notifications on an interface, perform the steps in this section. Configures the community access string to permit access to the SNMP. Enables notifications for when the rate limit set on the NHRP packets is exceeded on the interface. By default SNMP notifications are sent as traps. All NHRP traps are sent to the notification receiver with the IP address 192.40.3.130 using the community string public. Exits the current configuration mode and returns to privileged EXEC mode. Use the debug snmp mib nhrp notif[detail] command to troubleshoot SNMP NHRP notifications. The Interface State Control feature enables the system to control the state of an interface based on whether the DMVPN tunnels connected to the interface are live or not. To configure interface state control on an interface, perform the steps in this section. Configures an interface type and enters interface configuration mode. Enables NHRP to control the state of the tunnel interface. This feature provides support for SNMP NHRP notifications. The following commands were introduced or modified: debug snmp mib nhrp notif, snmp-server enable traps nhrp, snmp-server host nhrp. This feature enables NHRP to control the state of the tunnel interface based on the health of the DMVPN tunnels. The following command was introduced: if-state nhrp. This feature enhances existing DMVPN syslog messages to provide additional syslog messages for NHRP for DMVPN events.